Taking a cat for a walk so it could get some exercise is not very practical. But cats, as any other pet, require regular physical activity and some exercise. The best thing you can do for your feline friend is to get it a cat tree.However, there are a lot of options available on the market which makes the right choice a bit difficult. 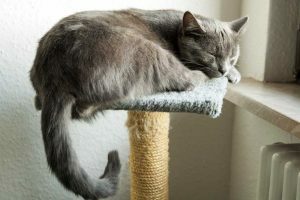 Also, cat trees come in different shapes or sizes and can have a number of added features like hanging toys, scratching posts, and hideaways.In this article, we will review some of the available options and help you select the best cat tree to fit both your home and your pet. The F712 is Go Pet Club’s second largest cat tree. It comes with a large number of sisal-covered areas on the posts, which should keep your cat away from the furniture. This cat tree comes with a sizable baseboard, so you might need to dedicate a bigger area of your room. The Go Pet Club F712 is very tall at 62 inches, and the baseboard is 26 by 19 inches. It features a spacious top perch with raised edges, a few baskets, and a small condo for your cat to sleep or hide in.The cat tree has two tiers, not including the top perch. There are six sisal scratching posts, a stepladder, and a dangling rope next to the condo. The few baskets that come with this cat tree offer many options for your feline friend to lounge around or nap.The cat tree is big enough to house more than one cat. The compressed wood construction is sturdy and the comfortable faux fur cover is a hit with all cats. The cover material is super soft and pleasing to your cat. This cat tree offers a lot of climbing options and cats like squeezing through the tube below the top perch or the swing under the middle tier. The overall construction of the cat tree feels stable, so cats can jump up and down without the risk of toppling anything. This cat tree may be a bit big for some homes. As previously mentioned, the larger footprint might require a bigger room, or a corner dedicated only to this cat tree. Other than that, the Go Pet Club F712 is a great value for the money, especially if you have a couple of cats. This is the smallest cat tree on the list, but the affordable price and very high user rating make it one of the favorites. The TRIXIE Pet Baza is ideal if you are strapped for space. It can be placed almost anywhere and you could bring it along if you travel with your cat. The TRIXIE Pet Baza weighs only 10 pounds and the dimensions are 16 x 16 x 20 inches (LWH). There are two scratching posts of 3.5 inches in diameter. The posts are fully covered with natural sisal and there is a pom-pom toy dangling from the top of the left post. The cat tree features a long-haired plush hammock with a metal rim to ensure additional support.There are other bigger models available from the same company if this one is too small for you. The manufacturer offers a one-year warranty on this cat tree. It is available only in cream color. The overall size and portability might be some of the best things about this cat tree. Also, it is very sturdy and one of the best-built cat trees in the small category. The long-haired fabric covering the hammock and the base will be very comfortable for your feline friend. Even though this is a small cat tree, it can accommodate bigger cats. They usually enjoy lying in the hammock or playing with the pom-pom toy. While the long-haired fabric can be very comfortable to cats, it seems a bit artificial to the touch. The cream color fabric can get dirty very quickly. The AmazonBasics Cat Activity Tree has a rather slim profile, so it can fit snuggly even in small corners. It’s also not very tall, so it won’t overwhelm a space. This AmazonBasics cat tree features three platforms with a top perch. The perch has raised edges so cats can use it as a bed. There are seven jute-wrapped scratching posts. 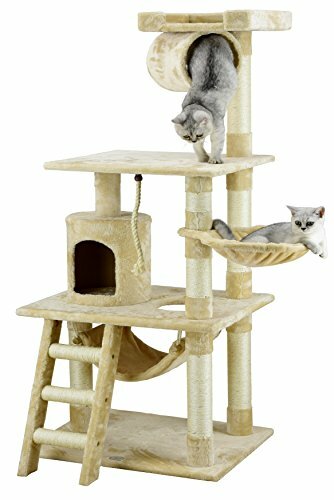 The number of scratching posts is comparable to bigger and more expensive models, but no toys, dangling ropes, or any other add-ons come with this cat tree.The cat tree is 45.9 inches tall and the base measures 17.7 x 17.7 inches, which puts it in the medium-sized category on our list. The shipping weight of this product is only 25.5 pounds.The materials used for the AmazonBasics cat tree are compressed wood, carpet, and jute. You should note that jute and sisal are not one and the same. Even though both are natural materials, sisal rope is generally considered more durable. The lightweight and compact design might be the best things about this cat tree. This cat tree comes at a very affordable price, especially for a cat tree of this size. The assembly is also very easy. You just screw the pieces together following the instructions that come in the box. The box includes all the tools that you will need for the assembly. Even though the light weight might be one of its biggest assets, it could also present a major problem. Some users complain about the stability of this cat tree, for it is very tall for its weight and footprint. In addition, the scratching posts are made of cardboard, which makes this cat tree a bit flimsy.The jute which covers the scratching posts is not as durable as sisal rope. The carpeting on the platforms and the top perch is comfortable enough but can feel a bit rough and artificial. Toppling is probably one of the biggest issues with this cat tree, especially if you have a couple of good-sized cats. The Armarkat Classic Cat Tree is probably the best value for money on our list. The manufacturer has been around for more than two decades and boasts international recognition as one of the most reliable cat tree manufacturers. We gave the Armarkat cat tree the second highest rating on our list. This compact and durable cat tree is made of premium materials. This medium-sized cat tree sports a rather appealing design which blends well with any room. 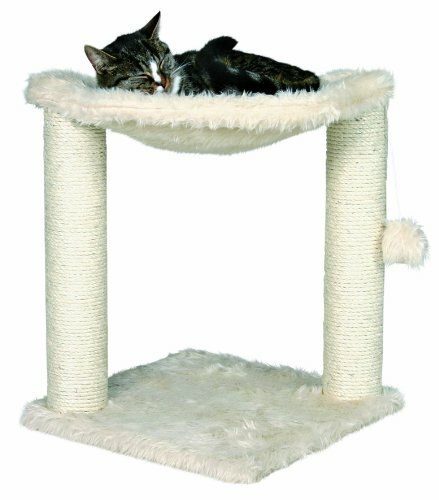 The Armarkat Classic comes with ivory-colored scratching poles and light pink faux fur.The cat tree has three platforms with a top perch. It has five scratching poles, a ramp, and a small cat condo in the middle. The platforms and scratching poles are made of high-quality pressed wood and covered in faux fur. The faux fur is very soft and comfortable for the cats. The top perch has slightly raised edges, so it may not be ideal as a bed.The base of the cat tree measures 24 x 22 inches and the whole thing has a height of 53 inches. These dimensions put the Armarkat cat tree in the middle of our list in terms of size. Coincidentally, or perhaps logically, it’s also the third heaviest cat tree at 36.2 pounds of shipping weight. But, the weight-to-size ratio of this cat tree is perfectly balanced which makes it very stable. The combination of quality materials, high durability, and beautiful design makes this cat tree one of our top picks. If you add the affordable price and one of the highest user ratings to the combination, the Armarkat is a cat tree you should take into consideration.It’s very easy to assemble. You will find the instructions and tools included in the packaging. Once you put this cat tree together, your feline friends will enjoy comfortable materials and plenty of room for jumping or climbing. In addition, the scratching poles will keep them away from your furniture. It is very hard to find things to dislike about this cat tree. One of the downsides might be the lack of add-on toys. It would have been nice if the manufacturer had included at least one dangling rope or pom-pom toy. 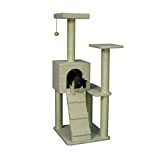 Such an addition would make the Armarkat cat tree one of the best cat trees on the market and enhance the play potential for your cats.Also, the Armarkat has a large footprint, so it might not fit if you need to place the cat tree in a small room. 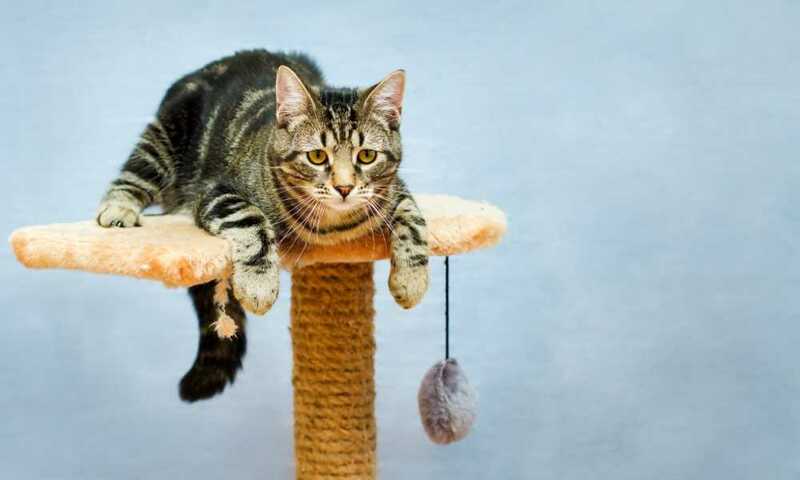 However, this is one of the best cat trees on our list, and it could potentially provide your feline friends with years of exercise and fun. 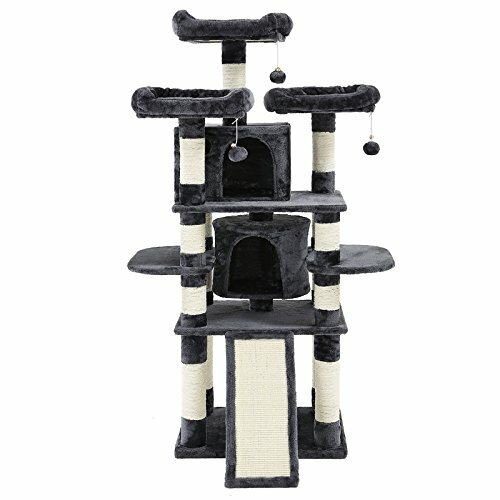 If you are in the market for a luxurious condo for your cats, this SONGMICS cat tree is the thing you should check out. This cat tree is designed with great attention to detail, which is reflected by the highest rating on our list. The SONGMICS Cat Tree Condo is more than just a cat tree – it provides your cats with an unparalleled luxury condo experience. The dimensions of this cat tree are quite sizable. The base measures 23.6 x 21.6 inches, and it’s the tallest cat tree on our list at 67 inches. The SONGMICS cat tree is also the heaviest at 64 pounds. This kind of weight-to-size ratio ensures stability no matter how many cats you might have.This is the best cat tree on our list for its numerous features and high-quality finish. The manufacturer markets this cat tree as a multi-layered playhouse for cats. It comes with 2 spacious cat condos and 3 top perches with slightly raised edges. The cat tree also features a front slope covered in sisal rope.There are eleven scratching poles. They are wrapped in sisal rope and measure 3.83 inches in diameter, which adds to the cat tree’s stability. The platforms are CARB-certified natural particle boards and the cat tree includes battens at the base for increased stability. In contrast, the scratch poles are reinforced cardboard tubes.The manufacturer offers a 2.5-year warranty on this cat tree that comes with 3 pom-pom toys dangling from the top perches. You can choose to purchase the SONGMICS in a light or dark grey color. There are a lot of things going in favor of this cat tree. The size may accommodate an entire litter of cats without jeopardizing the stability. The plush fabric which covers the cat tree is of high quality, and your cats will enjoy its comfort and softness.The spacious condos will allow your cats to have great naps and the dangling pom-poms should keep them busy for a long time. The number of scratching poles and the sisal-covered slope should keep the cats away from your furniture. With this cat tree, you’ll have plenty of things for your cats to sharpen their claws and chew on. Even though this might be the best cat tree on our list, it also comes at the highest price. So, if you are in the market for a budget cat tree, the SONGMICS might not be the right option for you. Also, it takes up a lot of space and can dominate a room, so be ready to dedicate a large corner for this cat tree.The SONGMICS Cat Tree Condo has a lot of parts and isn’t exactly easy to assemble. Some users also complained about the quality of the instructions which came with the SONGMICS tree house. So you should know that it might take you a while to put it together. There are a lot of different types of cat trees. They range from simple sleepers to full-size and wall-mounted cat tree systems. Choosing the right one can depend on your budget, preference, and the number of cats you need to accommodate. However, you shouldn’t overwhelm your home with overly large or complicated cat tree systems. The common materials used in cat trees are sisal or jute for wrapping the scratching poles. Compressed wood or corrugated cardboards are used for the platforms. Cat trees are usually covered in carpet or faux fur. It is worth noting that sisal and compressed wood are more durable than jute and cardboard. There are single and multi-level cat trees. Single-level cat trees can usually accommodate one medium-sized cat, although there are models with larger footprints which can fit bigger cats. Multi-level cat trees are suitable for a few cats and many of them come with additional perches, cat condos, and other features. But, keep in mind that cheap multi-level cat trees can be unstable, as you’ll usually get what you pay for. It is advisable to place your cat tree against a wall and on a flat surface. However, the support is largely determined by the weight-to-size ratio of your cat tree. This means that if your cat tree is light and big, it might be unstable and prone to toppling. In other words, a large cat tree should be on the heavier side and a light cat tree should be on the smaller side. Cat trees usually come in three sizes: small, medium, and large. The small ones are portable and can accommodate one cat. Medium cat trees should sit on the floor and feature more options, and some of them might be able to house several cats. The large ones can be full-fledged cat condos with multiple levels and more than a few add-ons. If you purchase a cat tree, you should find the instructions or owner’s manual in the box. Following the instructions should be simple, but some cat trees are more intricate than others, so be ready to spend some time assembling them. On the other hand, the Internet is full of videos and instructions on how to build your own cat tree. You may use common household items such as plastic bottles, cardboard boxes or tubes, and surplus soft fabrics. However, stability and safety are very important, so make sure to err on the side of stability. How to Carpet a Cat Tree? Re-carpeting your old cat tree or carpeting a DIY one is quite simple. If you are re-carpeting an old cat tree, take apart the cat tree completely and remove the old carpets. Sand down the excess fabric and glue, and then apply a new layer of glue. Gently wrap the new fabric around the material and make sure there are no wrinkles. The same process applies for DIY cat trees, but you can skip the part about removing old carpet. How to Clean a Cat Tree? The approach to cleaning a cat tree depends on the cat tree you own. If your cat tree is made of cardboard, you should avoid excess moisture and aggressive cleaners. However, the ones that are made of wood can withstand more moisture and stronger cleaning agents. The tools you need are a vacuum cleaner, hair removal brush, microfiber cloth, and combing tool.You may want to use some chemicals to remove cat urine. Other than that, any pet-friendly cleaning agent should be just fine for your cat tree. By definition, a cat tree is a man-made structure, DIY or mass produced, designed to make the lives of our feline friends better. Cats can play, exercise, relax, and sleep in their cat trees. It is also known as a cat tree house, kitty/cat condo, cat stand, cat post, or cat tower. How to Replace Sisal Rope on a Cat Tree? Take off the old rope. Wrap and glue the new rope on. When you get to the end, cut the new rope. Glue the rope end and you are good to go. Finally, our recommendation for the best cat tree would be the Armarkat Classic Cat Tree. The unique combination of build quality, comfort, and stability at an affordable price makes it a perfect option for most cat lovers.